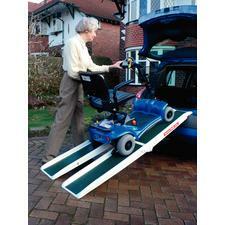 Vehicle access can be achieved by several means and for several different reasons. Manual ramps can be used for the stowage of light weight, unoccupied wheelchairs or small shopping scooters. 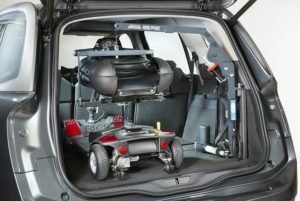 They can be easily folded and stowed away in the boot space of the vehicle. For heavier more cumbersome items such as powered wheelchairs or large shopping scooters, a powered “crane like” boot hoist can be used to lift the unoccupied equipment into the vehicle. There are several different types of hoist with specific lifting capacity depending on the application.